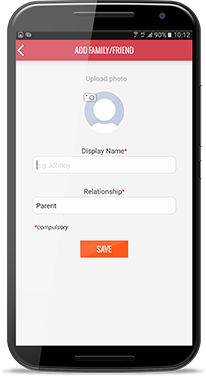 The Family and Friend’s Health feature enables care receivers (patients) to authorise designated caregivers to view their health and medical records stored in public health systems. These records are for reference only, and may not be the latest or the most comprehensive. If you have medical concerns, please seek professional medical advice from your physicians and/or healthcare providers. This service is only available to Singapore Citizens and Permanent Residents aged at least 21 years old. How do I grant access to share my health records? 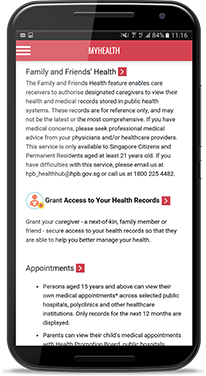 Go to myHealth, scroll down and click on "Grant Access to Your Health Records". Enter details of your caregiver (NRIC, email address and contact number). Choose which medical records you wish to share, then click on Finish to save. You will receive a mail notification to confirm that access has been granted to your selected health records. 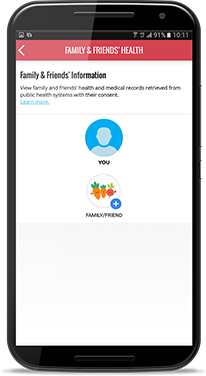 Please notify your nominated caregiver that he/she will now be able to add you to his/her list of Family Friends' in HealthHub. Decide which of the health records to share with your loved ones. They will only be able to access health records you have selected, ensuring that your details are safe and secure. You may edit their access at any time. Keep them updated of your health records conveniently. *Only from selected public hospitals, polyclinics and other healthcare institutions. Grant access on myHealth today and experience a new way to keep those you care for right within reach. Prior consent is required from your loved one before you may access their selected health records. Do confirm if you have been added as their designated caregiver before accessing their health records. Go to myHealth, scroll down and click on Family and Friends' Health. Click on "+Family/Friend" in the Family Friends' health section. Enter their details (NRIC and email address) to complete process. Do note that you will only be able to view health records that they have given you permission to access. Access HealthHub now to better manage the health of your loved ones. Who are eligible for this service? 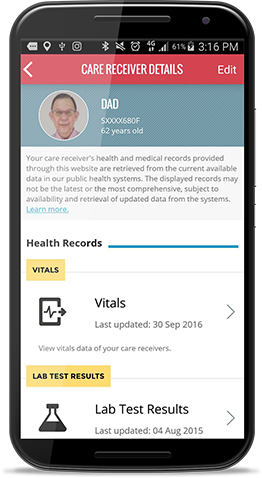 Where does HealthHub draw its health records from? I have changed my mind / made a mistake in granting access to my caregiver. How do I revoke access? 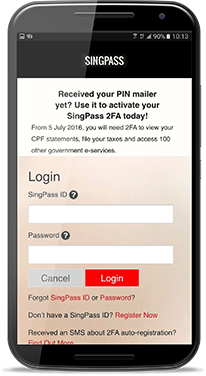 Access MyHealth with your SingPass account and click on "My Caregivers". 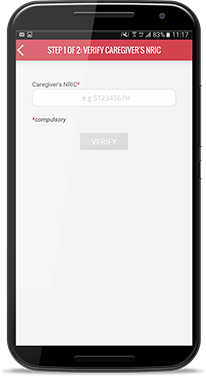 Select the individual from the list of caregivers and click on "Edit". Proceed to click on "Revoke". Upon successful completion of this action, the selected individual will not be able to view your personal health and medical records any longer. Do I need a lawyer to grant consent to my caregiver? Do I have to pay to view my care receiver’s personal health and medical records on HealthHub? Can I decline to view other’s health and medical records? What rights do I have after my care receiver has granted consent to me? 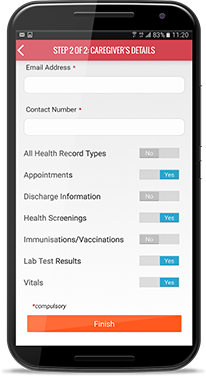 The consent granted to you on HealthHub simply means that your care receiver has granted you consent to access and view his/her personal health and medical records on HealthHub. For more information, please access FAQs and click on "CareGiver Access FAQ" here. Grant access to your family member, next-of-kin or friend – secure and convenient access to your health records now. Still unclear? For more questions about the Family & Friends section of the HealthHub, simply call the HealthHub contact centre at 1800 225 4482. Or, email us at hpb_healthhub@hpb.gov.sg.